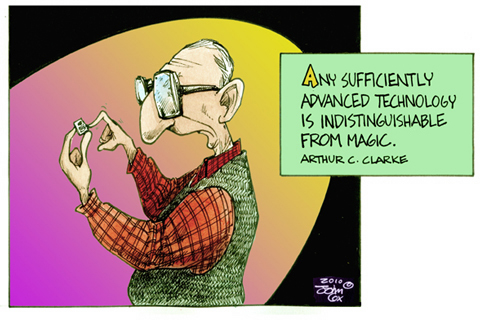 Any Technology that IS distinguishable from Magic is insufficiently advanced. That version is clever and weirdly accurate. So does magic not really exist or does it merely denote something that is not yet understood? Likewise, does a miracle cease to be a miracle when we understand how it happened? Or must it be defined by our absolute inability to ever understand it? In which case, calling something a miracle seems like an impossibly large claim. Quiptoons that make you go hm. Clarke has been labeled a 'genius'. If that's so, why is he dead? Let me boil this down simply! Any advanced technology for which I have to read the manual/instructions is neither magical, nor sufficiently advanced. Advanced technology to be truly magical requires making it simple. Any piece of technology requiring a manual larger than itself loses all magical properties. Thanks a ton for your time and effort to have decided to put these things together on this blog site. Josh and I very much treasured your input through your own articles about certain things. I'm sure that you have quite a few demands on timetable and so the fact that a person like you took the maximum amount of time just like you did to guide people like us by means of this article is actually highly prized. All of this is some superb tips! I personally make an attempt to keep up with your web-site's tips on our Google Reader. Great blog and I like what it's important to say and I think I will tweet this out to my mates to allow them to check it out as well. I like what it's important to say. nice submit and I completely agree with you on all points and I am interested by adding a link on my blog to your weblog put up because its that good. What would many of us do minus the magnificent tips you talk about on this site? Who else has the tolerance to deal with critical topics in the interest of common subscribers like me? My partner and i and my guys are very lucky to have your website among the ones we generally visit. Hopefully you know how much we love your efforts! Best wishes from us all. Most I can express is, I'm not sure what to comment! Except certainly, for the superb tips which are shared within this blog. I am able to think of a zillion fun ways to read the articles or blog posts on this site. I do believe I will finally take action with your tips on those issues I could never have been able to handle alone. You are so careful to permit me to be one of those to profit from your beneficial information. Please see how much I am thankful. I got what you mean , thanks for posting .Woh I am pleased to find this website through google. People deserve good life and credit loans or just short term loan can make it better. Because freedom bases on money. It was a very nice theme! Just wanna say thank you for the data you have apportioned. Just continue writing this kind of post. I will be your true reader. Thanks again. This page contains a single entry from the blog posted on December 12, 2010 11:21 PM. The next post in this blog is Reproduction #2: "Caveman Diet".